If you have processed an authenticate transaction through your account, and you no longer wish to process this you are able to perform a Cancel. Before doing so however, you must first ensure that the user you plan on performing the Cancel with has the privileges to do so. After logging into the account you will first need to locate the transaction you wish to cancel. Now that you have located the transaction you wish to Cancel you will need to click on the authenticate to bring up the transaction detail screen. 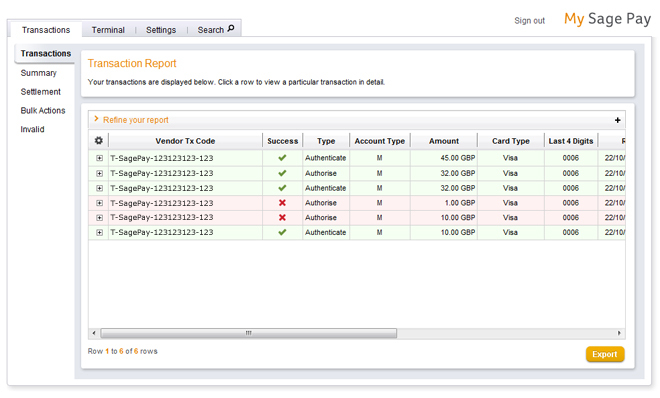 On the bottom right corner of the transaction detail screen you will have the option to cancel the transaction. Click on cancel, and you will then be prompted to enter your password. Complete this step and select cancel again. Your transaction will then be cancelled and appear within MySagePay as a failed transaction.